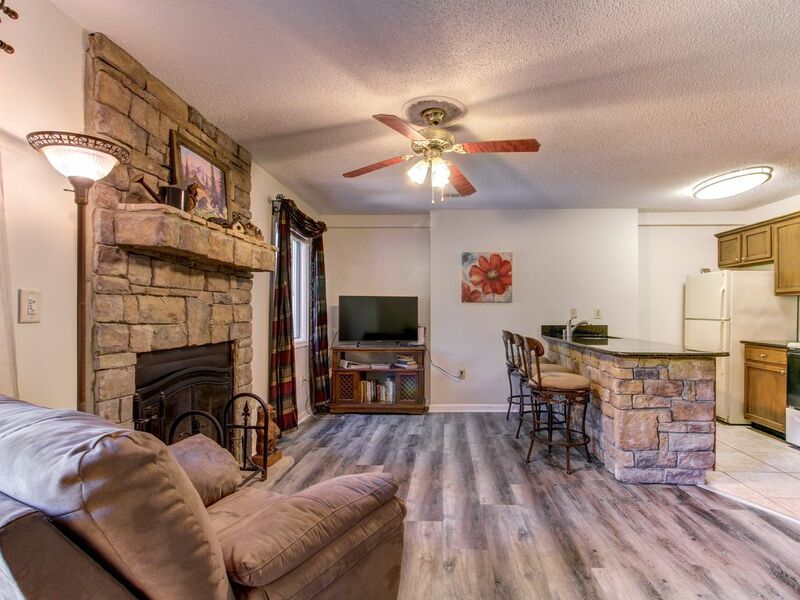 Vacation on the banks of the Chattahoochee River at this cozy condo, ideal for your next family getaway! Enjoy a full kitchen, wood-burning fireplace, and a furnished deck with a view of the river. Almost everything in the town of Helen is within walking distance. Enjoy the Bavarian-style architecture, restaurants, gift shops, and exciting special events, including the annual Oktoberfest. This home boasts an incredible location right on the river, with beautiful views and a spacious deck overlooking the water. Inside, you'll enjoy a full kitchen, free WiFi, and cable TV, along with a fireplace for those cold winter nights and river access right outside. The family dog is also welcome for a small nightly fee. If you're traveling with a larger group, there are also two adjacent condos (402 above and 502 next door) that can be rented with this condo to accommodate large parties of up to 16. Discover the fun of Helen at this charming rental. Book today! Parking Notes: There is off-street parking available in front of the units. My family love this place. Location great , everything walk distance! We appreciate the feedback we have received from this guest. There is a covered patio right off the living room that offers a table with four chairs, and we will ask the owner about providing a fourth bar stool. We are also investigating the heat and shower heads so we can ensure they are all working properly for our guests. Thank you! We did Not enjoy our condo stay at all ! Three of us had to squeeze onto the sofa to watch TV and only one recliner in living room. Temperature could not be regulated throughout the house. Either too cold or too hot! All shower heads need to be replaced they were not adjustable and came out fine stream forcefully that hurt when you showered under it. Not good! Beds were comfy and close to town. Wasn't worth the $$$$ for three nights. Over priced and too many fees attached. Thank you for letting us know about the shower heads, as well as sharing your other feedback. Our local operations manager will look into these issues, and work with the owner to try improving the experience for future guests. This was a great property! Very clean and nicely decorated. The perfect spot for a quick get away to Helena, GA. Thank you for having us as your guest! Clean and cozy condo. Good location.